Hugh and Carol Nourse@Flickr, of Georgia, USA, seem to have taken a trip to Arizona this spring, where one of them captured this photograph of Calliandra eriophylla (shared via the Botany Photo of the Day Flickr Pool). Thanks once again! 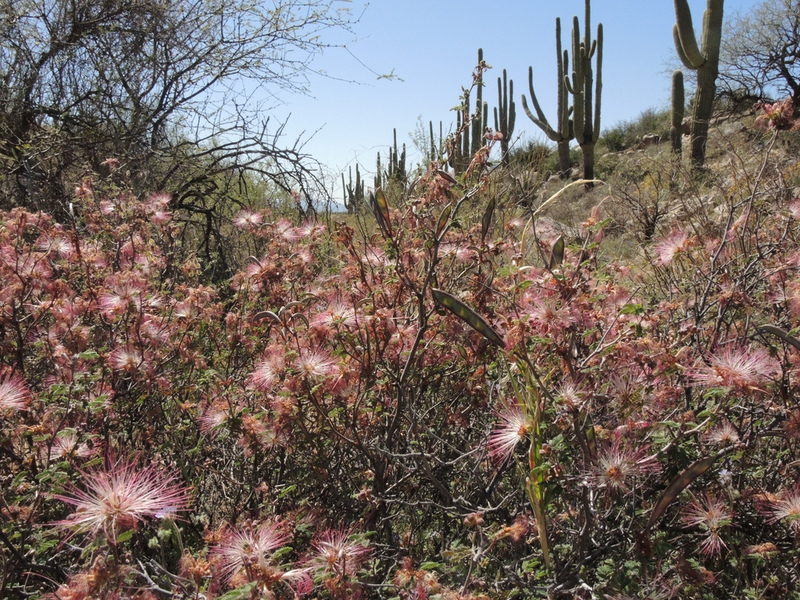 Fairy duster has previously been featured by Eric La Fountaine: Calliandra eriophylla from June 2009. Today’s photograph shows the plants in situ, or in habitat, growing along the Sutherland Trail in Catalina State Park. Occurring in both the Sonoran and Chihuahuan Deserts, Calliandra eriophylla primarily blooms in the spring flowering season. Plants may infrequently bloom at other times, though. As Eric alluded to, the showy parts of the flowers are not the petals, but rather the long filaments of the many stamens (link includes additional photographs). The flowers are sooooo reminiscent of the flowers of a Mimosa tree that was in my backyard when I was a kid in New York City. It created seedlings everywhere, shaded out most of our tiny garden and my parent’s neighbors hated it. But, I always thought it was gorgeous, smelled delightful and attracted a slew of butterflies when it was in bloom. When I got a little older and more interested in botany and discovered that it was in the Fabaceae family, I was shocked to find it was related to our peas! Thanks for this photo. It’s really interesting to see the plant in its habitat. I have never seen Calliandra. Are its filaments much firmer than the flowers of the Albizzia genus? Calliandra is derived from the Greek kallos, “beautiful,” and andra, “stamen”.